The apple green and cream buses and coaches of Southdown Motor Services have been a firm favourite with bus enthusiast for many years. The original company has passed into history, so it is to the preserved examples we look to today that keeps the memory alive. It is fortunate that quite a few examples have been saved from the scrap man's torch for us to enjoy at bus rallies and running days. This video programme does just that, as we pay visits to two events held in the beautiful county of Sussex to relive the memories of a bygone era. Our first is to Horsham where an event was held on 1st September 2013. Our cameras were at the Hop Oast Horsham Park & Ride car park to record the arrivals of the vehicles. 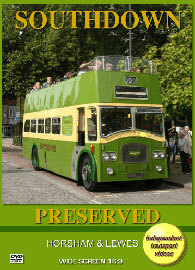 We then board open top “Queen Mary” Leyland Titan, 409 (409 DCD) for the short journey into Horsham town centre. On arrival we film the vehicles running through on the various routes organised for the day. It is then time to bard Leyland Leopard 122 (BUF 122C) for the long journey to Steyning. Running through the lovely countryside we can enjoy the views from the windows whilst listening to the Leyland O600 engine roaring away! We return to the rally site to film more action and then board another Leyland Leopard, this time 199 (KUF 199F) for a run back into Horsham. With more filming complete here, we sample 651 (AAP 651T), which is a Bristol VRTSL6LXB in the leaf green and white livery representing the Company’s time with the National Bus Company. The Bristol takes us back to Hop Oast for us to take a ride on another Bristol, this time it is 481 (TCD 481J) an RESL6L with a Marshall single deck body for a ride to Horsham and back. Filming is completed as the vehicles leave for their homes after a most enjoyable day. Our second event took place on the 8th June 2014 at Lewes. We start our filming at the Malling Recreation Ground where we see the vehicles arriving for the day’s activities. Our first ride of the day is on board open top Leyland Titan 422 (422 DCD) for the short ride to Lewes bus station, which was also home to the small Southdown bus garage. We film some of the action in the town and then return to the rally site for more action. The next ride is on the “PD3/4 Special” service. This year, 2014 marks the 50th anniversary of the two batches of the famous Southdown “Queen Mary” convertible open top buses entering service, so a procession of three such vehicles went on a journey out along the A27 and back in through Lewes to mark the event. Our cameras travel on the top deck of 417 (PRX 189B) (417 DCD) to film the ride and to see the following “Queen Marys” from our vantage point at the rear of 417. On our return to the rally site we then sample a closed top example for the long journey to Newhaven. This is on board 277 (BUF 277C), where we get both the passenger and drivers view as we ride through the Sussex countryside. Back at the rally site we film some of the departing vehicles from this most enjoyable event. To finish our programme off we have a treat for you! We have some short cine film clips from the cameras of Richard Newman and Bob Gray featuring the ‘real’ Southdown in action in the late 1960s and early 1970s. Enjoy!